Dancers Geoffrey Kropp and Alyssa Gold in the piece Memory Palace. 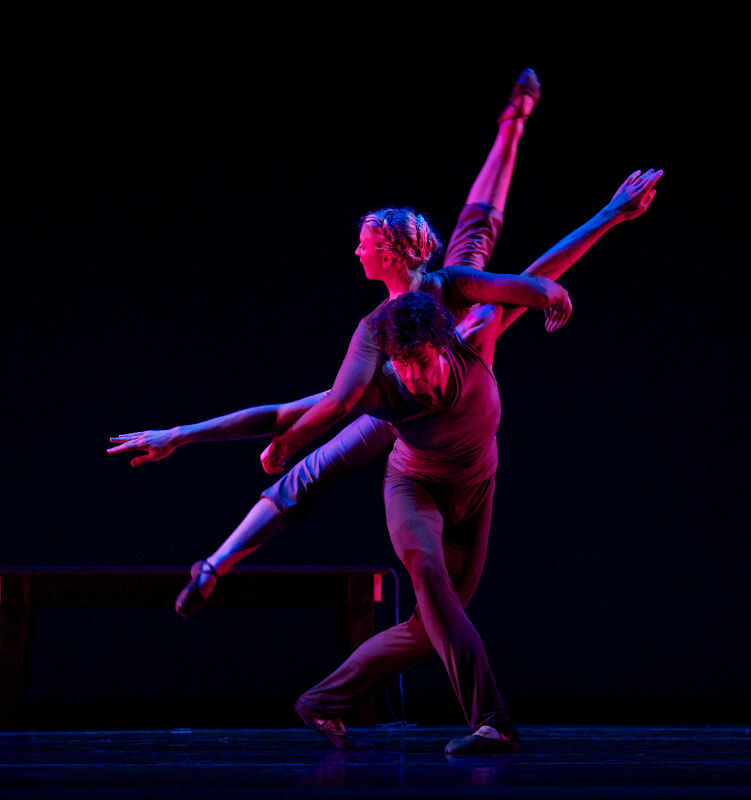 Dancers Sarah Chun, Alyssa Gold, and Michael Davis in the piece Memory Palace. Bach Aria Soloist founder Elizabeth Suh Lane and Owen/Cox co-founder Jennifer Owen. Along with the dancers, Owen/Cox includes musicians that comprise the People’s Liberation Big Band. The members will soon be seen in The Nutcracker and the Mouse King in mid-December. The two performances will be at the Polsky Theatre at Johnson County Community College. They also performed at la Esquina, a Charlotte Street Foundation gallery space, in early October. The season closer will be at the University of Missouri-Kansas City’s White Recital Hall. In the past couple of years, Owen/Cox Dance Group has also been part of the New Dance Partners that unite them with the Kansas City Ballet and Wylliams-Henry. There is also a special fundraiser Feb. 15 at the Todd Bolender Center for Creativity and Dance. The two look forward to future collaborations. “We have a supportive base, and I hope that we will expand our audience as we work with other artists, including visual artists and those with incredible musical talent. We can also gain more as we perform in other venues. The more we can be seen and share our work, the better,” she says. The two choose works that are fun to present. “The Nutcracker and the Mouse King is appealing with the story we tell,” Owen says. The contemporary dance troupe returns to the original E.T.A. Hoffman story dating from 1816 for their inspiration. As with other stories, the Nutcracker comes to life and battles the Mouse King and then whisks the female lead, named Marie in this tale, to the magical kingdom populated by dolls. It was another 76 years when Tchaikovsky turned Alexander Dumas’ adaptation into the ballet. This year marks the group’s sixth run with the holiday show. The People’s Liberation Big Band is featured prominently, as well as designer Peggy Noland’s costumes. “The appeal of The Nutcracker is the fundamental fairy tale,” Cox says. “It is a story of the redemptive and transformative power of love, similar to Beauty and the Beast .” Owen agrees, but sees Marie as the character she understands. “This is a girl coming of age. She is passing through childhood into adulthood.” The performances are 8 p.m. Dec. 13 and 2 p.m. Dec. 14 at the Polsky Theatre, Johnson County Community College. Cox says Ludus Tonalis, by composer Paul Hindemith, is a contrapuntal masterpiece that has never been choreographed to before. Following the success of Owen/Cox Dance Group’s 2013 performance of the Goldberg Variations, pianist Kairy Koshoeva again joins with the ensemble to present this masterwork of 20th century piano literature. Elizabeth Suh Lane, artistic director and founder of the Bach Aria Soloists, will also join them on the June 6 performance at UMKC’s White Recital Hall. Suh Lane will perform J.S Bach’s Partita No. 3. to Owen’s original choreography. “We choose dances and projects that are fun to present,” Owen says. “I want to offer energetic, playful, and thought-provoking pieces that allow audience members to experience the works with new ears and eyes.” Along with their performances, Owen/Cox now has Take the Stage, an educational outreach led by artistic director Rebka Sakati. Cox says the program is now in four schools and reaches fourth-graders. They will add a fifth school in January. “We didn’t envision this specific educational mission, but it has been a great opportunity,” he says. Owen/Cox Dance Group also serves as sponsors for the annual Kansas City Dance Festival. “We keep our eyes open for opportunities to grow artistically,” Owen says. “We aim for organizational and artistic growth.” Both applaud an active and supportive board. Right now, the two plan to continue to present three to four shows for a season.